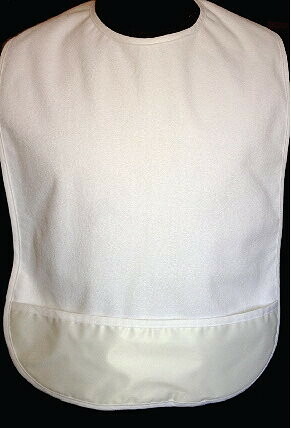 100% Cotton front adult bib with full vinyl backing and convenient bottom pocket to catch spills and falling food. Machine wash & dry. Designed to be worn by individuals who have upper extremity or eating and swallowing disabilities. Constructed of 100% cotton fronts with a lower pocket to catch spills. Easy velcro closure at the back of the neck.